Her feet slap the wet pavement in time to the beat in her headphones. Echoes of her footfalls rebound off the houses on the street in a counter rhythm to the music. She runs through the wet night, moving in and out of the orange pools of light set down by the mercury vapor streetlights. The rain that began a few hours ago is heavier now, each landing drop taking a bit longer to lose its shape to the water already on the ground. It will be snowing soon, and her run will get drier. Glad she chose to dress for the weather, she plunges ahead, cursing only when a particularly fat, cold drop hits her between the eyes. The rush of air cools her cheeks and nose. She reaches up and tugs her hat a little further down over her ears. The sound of the night is beginning to change. The hiss of tires on the wet pavement roughens as the temperature continues to fall and the liquid on the street thickens. The normal noise of the neighborhood slows, and pauses, in anticipation of the snow, the waiting stillness punctuated by occasional dog barks. The sun had set some time ago, but it is early enough that people are still arriving home from dance classes or weather-cancelled soccer games. Lights are coming on up and down the street. Right now the neighborhood has an energy of activity, even in the anticipatory quiet. In an hour it will grow still and sleepy, ready to be tucked in for the night. On her summer runs she listens to the clank of dishes being washed after dinner or the shouts of last games being played before parents call the kids in. In fall and winter, it’s different. Only rarely will the sounds of a TV turned too loud reach her, or a bit of music from a passing car cut through the night. Winter means retreating inside, safe from the early dark. The recent, late warm spell has encouraged people to leave their curtains open and to cling to the last of the summer schedule, despite the ever earlier darkness. The light spills from their houses, across lawns and sidewalks as she speeds past. It is of a street full of televisions, tuned to mundane scenes with the volume down, showing short glimpses and moments of lives as she runs past. New bits of story add to the old, playing out silent movie-style to the soundtrack in her headphones. She learned this neighborhood on her runs. Starting with a single lazy loop around the block, she made a map of this new place in her head. She learned their stories from the things left in their yards and the look of their houses. She discovered the long history of the people who lived here and marveled at grandparents still living in the houses they had grown up in. Her roots had been pulled up early and often. A father seeking to make something of himself had started a long chain of moves. In the era of company cars for top performers, his house and family had to fit the part too. Eventually, he reached too far and the newly bought, status house was lost. So was the marriage. She found out it was possible to move into two houses at once. The years that followed were a parade of single-year leases of cheap apartments and condos; and of fights, her mother’s boyfriends, and boxes. After the first few moves, she hadn’t bothered to unpack anymore, simply digging through boxes when she needed something. The boxes became part of her room, each labelled with marker that had been crossed out and rewritten a half a dozen times. When the time came for college, she helped friends pack up rooms filled with memories, then returned to her latest residence, and sat, surrounded by boxes never unpacked. No bulletin boards full of pictures, or dressers filled with trinkets, were in her room, just boxes. No memories decorated the walls; they were just one more thing to pack the next time they moved. By the time she graduated from college, she’d almost tricked herself into believing that she liked moving. She spoke proudly of fitting all her belongings into her car to move across the country. Nomad, she called herself, and hoped it sounded exciting. On she runs, skirting one puddle just as a car scythes though another, sending an arc of water to land where she’d just been. She smiles and pushes her feet faster. She is at the point in the run where it feels like she can fly down the dark streets forever, a half-seen flash of person darting along the sidewalk. The snow arrives, but not all at once. In a steady, weighty fall of sleet, a single flake breaks ranks and floats to the ground. Then another. These first rebels meander their way to the ground amid the straight descent of their heavier comrades. As if those first few have convinced the rest, suddenly there are more wanderers than marchers, and the sound of the night changes again, and there is nothing but gently falling snow. This is the first snow of the season. 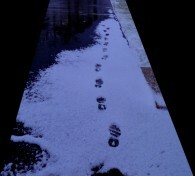 It is falling heavily enough now that her feet leave wet footprints in the white dusting on the sidewalk. She had a stockpile of memories of the first snow, laid out like photo albums in her head. The first snow thrilled her. She remembered waking as a young girl, surprised, to a world newly covered in white and her rush to be outside, her yard a land of trackless wonder that she would navigate until her socks and mittens got too wet and she had to return inside for hot chocolate. Later, when the constant moving had landed them in apartments, she watched the snow falling in the dirty parking lot in front of their building. From behind the window, the wonder of the first snow tarnished, like the gray tire tracks cutting through the piles of slush. The first snow after she moved out on her own happened in mid-September. It was early for snow. All day she and her friends had watched the storm roll in, dark clouds filling the blue sky and swallowing the mountains. They had pulled together mismatched winter outfits and gone to the concert they had tickets for, bundled like toddlers in puffy coats. She hadn’t minded as the snow accumulated on her shoulders, and she turned her face to the sky to feel the falling flakes. She cheered and danced in the gathering drifts as the band blew on their fingers to keep warm and told the crowd how crazy they were. Cold and laughing, she made her way home. At her apartment there was a message about an accident. She found herself piloting her car on a terrifying trip through snow-filled streets, across a blackout-darkened town, fallen branches blocking the way to the hospital. Each turn resulted in more dead ends and impassable snow. After hours of driving down dark streets, heavy tree limbs creaking above her, she finally reached her brother lying in a hospital bed. Snow hadn’t been scary before then. Everything she runs past is rapidly gaining a layer of white. Colors are hidden and the night gets brighter, a trick of the snow and clouds that she’s loved since she was a kid. The sky lights up, nearly orange, as it reflects the lights of the city, and everything is illuminated. She speeds her steps now. The temperature is taking a noticeable trip downward, and she can feel the chill settling on the outer layers of her clothing. Her body tenses with apprehension as her foot lands on the curb and slides, leaving a trail in the thick slush. She places her feet with caution, relieved she’s close to the end of the run. Faces press to the lit windows when the snow starts in earnest. She sees excited children, gleefully dreaming of the ever elusive snow day. Wary adults peer at the sky trying to divine traffic conditions tomorrow morning, or wondering where the gloves had gone in that last stretch of warm fall weather. A few grownups look as excited as the children next to them, and she hears them behind her, coming outside with shouts to match their kids’. Sounds of snowball fights chase her down the street. Gleeful shouts and squeals echo off houses, bounding ahead of her and calling other children outside. Soon after she married and moved into a perfect new townhouse, she had gotten pregnant. It was exactly as she’d planned. The townhouse had a great room for a nursery and a small den for a playroom. It was the type of place her father would have picked: executive, uniform, and neatly decorated. It was a place where successful people lived, she heard his voice in her head. A place where career professionals stopped momentarily before moving up to the next, better place. In the last month of her pregnancy, it snowed. She stood in the perfectly appointed nursery and watched the flakes come down. There were no kids here. This place felt empty, itinerant. There was no one exploring the changed landscape and giggling when a snowball hit them. There were only stomped tracks from garage to front door and muddy lanes in the parking lot. Her neighbors came and went invisibly. She knew none of them. She remembered the vast expanse of her only backyard, shining in the weak winter sun and the neighbor kids coming to build an igloo and make animal tracks. She remembered their army of snowmen and the hours spent outside playing. Pregnancy has a way of making you see things you haven’t seen before, and she knew, in that moment, this was wrong. This cookie-cutter condo in a development just like she had grown up in was not how she wanted her child to remember their first snows. The tears fell from her cheeks, onto her pregnant belly. This wasn’t what she wanted. She’d been following her parents’ blueprint: a blueprint that valued appearances and possessions; a blueprint that had not valued her. Years passed and they talked about moving, but never did. When she became pregnant with her second child, she knew they had to. Her daughter had just turned four, and was starting to wish for nearby playmates. Her stomach dropped when she saw her daughter looking out the window at the slushy, gray parking lot, just as she had as a child, wanting to burst outside to play in the new snow, but having nowhere to go. Her heart broke in that moment, and she promised her daughter that they would find a new place to live, with a yard, with playmates. He daughter hugged her, and she fought back tears as she held her close. The realtor returned an impossibly long list of possibilities. Only one house stood out and they returned to that neighborhood and drove through its quiet streets over and over again. One summer evening, they stopped for ice cream before returning for a third time to look at the house. She sat in the car with her daughter and husband, eating their ice cream cones and watching a game of hide-and seek-begin. It started with a single pair of children, and slowly others emerged from houses as if lured by some song only they could hear, until nearly a dozen kids of all ages stood ready to begin the game. Her daughter, standing wedged between the two front seats of the car, placed a small hand on her arm, and while staring intently at the kids outside, whispered, “Mama. Look.” And so they moved. She rounds the final corner and the sounds of snowy mayhem fade. Her playlist ends and she slows to a walk. Her breath clouds in front of her, now that it isn’t being whisked away in the wind of her running. As her breathing slows, the cloud hovers a bit longer with each of her exhalations. She walks slowly, deliberately, easing ankles and knees, keeping her body warm in the cold. At the hedge that hides her house from view she stops, pulling out her headphones and slowly stretching her limbs, indulging in a pause in the cold quiet. The silence is her favorite part of the first snow. It is so still that the silence becomes a sound, pushing at her ears as she tries to hear around it. She closes her eyes and takes deep breaths of frigid air, storing up peace for later use. She’d had a recurring dream, or rather a fragment of a dream, since the first move after her parents’ divorce. It was always a part of some other, larger dream that she immediately forgot, but this moment, this scene, stayed the same. She was walking through the edge of a nighttime forest, snow falling, and as she cleared the trees, she saw a house in front of her, slightly off to the left. It was medium sized and had a porch with white wooden steps. The house was painted a pale yellow and every window blazed with light. Strings of white lights adorned the eaves. Impossibly, light from the windows fell on the ground ahead, marking out a path that ended at her feet as she stood at the edge of the wood. She felt happiness and relief at seeing the path of light, and she would begin to follow it to the house. She could smell wood smoke, and she’d look up at the chimney to see a steadily rising plume of smoke joining with the snow clouds. The snow fell softly and everything was blanketed in white. The dream always dissolved as she reached the porch. Over the years, she’d entertained the idea that the house in her dream was real. She’d no reason to believe it existed outside of her dream, but still, she’d hoped. She took walks in the snow from time to time looking curiously at houses as she passed, wondering if she would find it this time. When they moved here, it had been with a new baby and a four-year-old. When the first snow arrived, she was more concerned with shoes that fit and hats that stayed on than with a house she’d only ever seen in dreams. She’d mostly forgotten about it, focused on the life that was unfolding in front of her, this time according to her blueprint. Sometimes, during the first snow, she’d remember the dream. After a long moment of holding herself in complete stillness, she turns and rounds the hedge. The dream image collides with reality with a physical thump, and she stumbles in surprise and flings out a hand, closing on the hedge for balance. This house has been theirs for nearly five years, and now she knows the people here, has seen the children in those brightly lit windows change from chubby toddler to lean kid. The stories she watches as she passes at a run now have names attached. This neighborhood is becoming her story as well. The sudden clarity of this image from her dream holds her frozen in shock, gripping the spiky hedge tightly in her hand. This is the yellow house, just off to the left, in the softly falling snow. The screen door slams; the moment shatters. Her girls come rocketing out into the snow, her husband close behind, pulling on his jacket. She watches from the edge of the pool of light thrown by the porch light as they toss handfuls of snow at each other. Fine snow still drifts down. The street is white now. She closes her eyes and listens to her daughters’ laughs and the gentle hiss of the falling snow. She inhales deeply, cold air stinging her nose, and holds the breath for a moment. When she lets it out, she feels the worry she’s held onto for years go with it. She watches the plume of her breath rise to gather and disappear with the chimney smoke that is climbing into the clouds. Her five-year-old spots her, and runs to her, small legs churning up a flurry of snow. Adina North lives in Portland, Oregon. Her past incarnations include theatrical stage manager and message board administrator. She spends her time raising her two daughters and trying to pick which hobby to spend time on. She is currently working on her first two books. You can find more of her writing at adinanorth.com. Good fiction takes the reader on a journey, and “First Snow” by Adina North does this. By using present tense and an unnamed main character, the author is able to put the reader into her shoes (almost literally) as she begins with a memory and expands on her life from that. And just as a jogger returns to where she began, so does this story bring the reader back to where the character started and the home that her dreams created. Hi Adina. 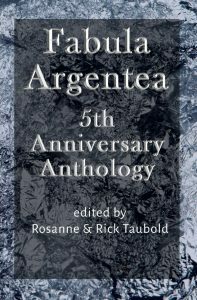 Seems fitting, inasmuch as we’re almost siblings here at Fabula Argentea, or at least next-door neighbors in the city of this Journal (Okay, I’m extending the metaphor a tad far), that I should stop by and enjoy your offering. I did, and I do … a lot. You are an exceptional writer. I–who live in Bakersfield, California where the closest we ever got to snow was a freaky two days about twenty years ago when my kids’ snowman melted before it was erected–had to put on my jacket this balmy evening as I loped along with your protagonist through the streets of, I assume, Portland. So well crafted, Adina. You are indeed gifted, and it is with brotherly pride that I will keep at least one eye focused on your literary future. Such a beautiful story. It warms my heart in more ways than one. When I read such a masterfully written piece, I’m reminded that I have a long way to go as a writer. Well done Adina.